April has been and will continue to be a busy month for concerts, as will May. It is due in part to last-minute concerts I heard about and didn’t want to miss. Last weekend’s chamber concert of Spohr and Brahms was one of those, as was tonight’s piano recital. Zhang is one of those pianists who, delightfully, after a recital, you feel like you know, like you’ve had a conversation with him over dinner or coffee, not across a concert hall. It was spectacular. Now, I love Chopin and Liszt and Schumann just (maybe not quite) as much as the next guy, but how many ballades or etudes or Kreislerianas can a person sit through? I have nothing against them, but there’s lots more one can hear. Let me say it this way: the biggest draw on the program for me this evening was the Prokofiev. I don’t recall ever hearing a single Prokofiev sonata live. This concert also came highly recommended, so with those two things in mind, I bought myself a ticket. I’ve been going to more and more concerts with friends or colleagues in tow (and getting to know more and more of the regular patrons of the two biggest symphony orchestras here), but tonight I was solo. For a solo recital. For all my own anticipation of the performance (reading his biography and accomplishments [on Wiki here] made him seem even more impressive), I was a bit surprised the hall wasn’t jam-packed. The kid won gold at Van Cliburn in 2009. Before he was 20. Anyway, this isn’t going to be a long article. While there’s a certain energy and buzz in a packed concert hall, sitting shoulder to shoulder with other eager concertgoers, there’s a sweet spot of empty seats that makes the entire concert hall seem like a more intimate recital-hall type setting, and we were just below that threshold tonight, at least where I was sitting. It felt a little bit too empty, but the result was that the concert felt more personal. This was due, in part to Zhang’s opening with four Chopin mazurkas, not from any one opus number (as below), from opp. 17, 24, and 59. I agree with whoever it was that said it that Chopin’s mazurkas are his most intimately personal compositions, so we did not begin with a bang, rather, a calming introduction of sorts. Zhang’s technique, control, expression are dazzling, as one might expect, but the impression I got (which might be different from others) was also a deep dedication to the music rather than a showy virtuosic performance with the jazz hands and cuff links and showy acting of some other piano virtuosos. It seemed like even if the audience (heaven forbid) began popping balloons and square-dancing in the aisles, he wouldn’t have been fazed. He was focused, even absorbed, and the Chopin mazurkas were a calming, delicate, but richly engaging beginning to the evening. Thus began what was the crescendo of the evening’s program becoming increasingly virtuosic and technically demanding, at least to my ear. Next was Schubert’s Four Impromptus, a late work, D. 935, and a long one. Zhang nailed the trademark of Schubert’s music: an understated, moving expression of both exquisite simplicity and depth. While I’m sure the entire piece is no walk in the park (let alone just the volume of music to be played), the final movement is noticeably more virtuosic than the rest, and while hands flung higher, head swayed and hair flopped, not a single movement was extraneous or ostentatious. It was no less than captivating. Even after the 30+ minutes of Schubert that had already happened, reaching the final allegro scherzando, the effect was nothing short of literally breathtaking. Then came an intermission and a much needed rest for the pianist, who, after playing such a meaty work, still had two large piano sonatas left on the program. The Chopin Bb minor is one I played to death when I first started listening to classical music, and it was Idil Biret all the way. Aside from the (literally hundreds of) listens to recordings, I’ve heard a number of people play it live, including Yuja Wang, but I have to say that Zhang’s interpretation made me hear the work (it sounds cliché I know, but it’s true!) in an entirely new way. He struck a magical balance of contrast to the work, not just Romantic-era virtuosic piano pounding or bubbling forth of emotion, but an expressive yet calculated execution of a work I’ve heard hundreds of times. The balance struck between the tender, lyrical aspects of the work and the stormy unsettling undercurrents even after the initial subject subsides made for a wonderful, new, fresh listening experience. The scherzo was taken at a fiery pace, the funeral march almost too solemn, but the final movement executed with poise. A highlight of the evening for sure. Not to be outdone is Prokofiev, with the second of his ‘war sonatas.’ This is a work I’ve listened to and ‘know’-ish, but not nearly as much as the Chopin. 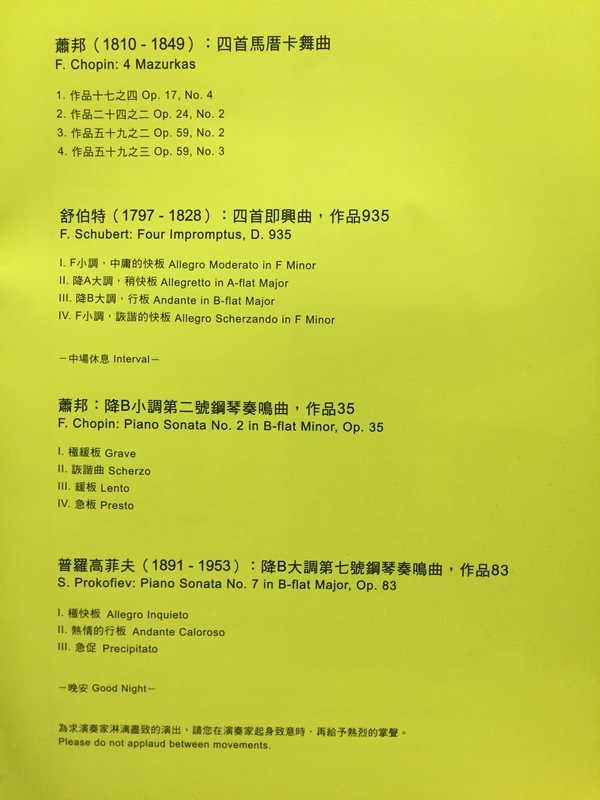 There were a few moments of the opening movement where I felt I could have used a bit more of the grotesque, brash, cacophony of the first subject, but the ‘parody’ of sonata form was well laid out in Zhang’s hands. The second movement set me lost in a world of empty contemplation, like a cerebral moment of silence, recognition and observation of tragedy, in which I did begin to think of interesting things like how a 25-year-old Chinese pianist goes about interpreting a WWII-era Russian ‘war sonata,’ and the head space he is in, which was effectively transferred to the audience. The final movement is one of the pinnacles of raucous in classical music, kind of making the first movement seem dainty and mannered. While true of the entire concert, especially of the Prokofiev, he played the hell out of the final movement. Before each piece, he was careful to wipe the keys with his handkerchief, and this would have seemed especially necessary after this piece. It was played with an almost exhausting-to-watch fury, but to mesmerizing effect. A fangirl was fangirling so hard she kind of started losing her cool; had I been within a few arms’ lengths of her, I’d have told her to stop wringing her hands and swaying and bouncing in her seat. Weirdo. This is a pianist who’s going somewhere, who played Schubert, Chopin, and Prokofiev in what I deem to be perfect idioms for the kinds of works they are, not just a virtuosity, but a deep understanding and a seeming drive to say something, something, mind you, besides “I play the piano really well,” or “I really like Chopin.” Convincing, compelling, and a joy to watch. He’s one of those performers who I’d go see again in a heartbeat no matter what was being played. Bravo, sir, bravo.